A crow picks her swaying way across fields searching for food. Three-pronged skinny feet splay, gripping slope. It would be better if this field hadn’t been plowed after harvest. Easier if the spray hadn’t killed what she eats. Crow Mother has no face, expects nothing. she sees but does not know. Through the beat of her wings. There is no confusion in her. Without sun’s reflection to glint off feathers’ perfect curve, a crow would be a chunk carved from the night forest. But a crow is not the bird of night, at least not the night sky with its starry crazyquilt or summer’s warm moon-work. The crow’s black is dense, storm or giant trees’ blotting of the dome. 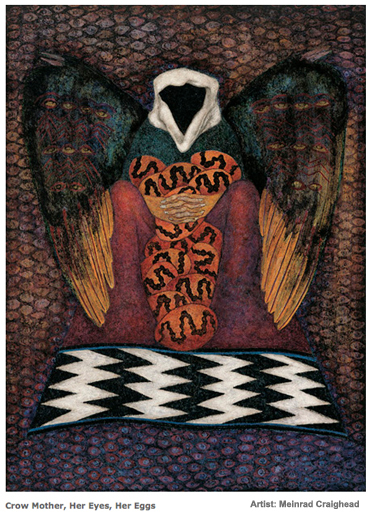 I was inspired to write ‘Crow Mother, Her Eggs, Her Eyes,’ when I found the painting by that name, created by Meinrad Craighead. Ms. Craighead subscribes to a belief in animal guides. In my neighborhood around the same time, I kept seeing this coterie of crows near my house, and I put together the physical crows with the metaphysical ones. The physical world we perceive and the mythical realm we create are tethered to each other. Out of the first arises the second. Myth serves our hunger for meaning. As poets and artists, we participate in the making of myth and how it sustains spirit. were blind, they’d been bred to their task. or gifted, tall or talkative or wholly wise. an invading force that did not speak to earth. This title from a poem by Kevin Prufer. I asked myself ‘What is our City?’ and got the reference to the mothers because who else makes life? I was reminded of the Native American myths of, in particular, Spider Woman and the Turtle that holds up the world, which catapulted my imagination into what our City (i.e., our World) might have been before the ‘invasion’ pulled us from union and grace. Grace Marie Grafton has been writing poetry for over four decades. Six collections of her poems have been published, the most recent Jester (2013). 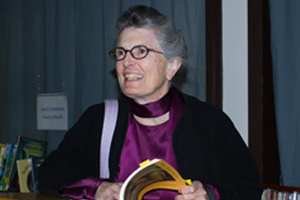 She has taught literally thousands of children the art of writing, through her work with CA Poets in the Schools. Some things that inspire Grace to write are orchids and ravens, art and meditation, love, curiosity and the sounds of words. She lives in the hills of Oakland, CA, near redwoods, oak and bay trees, salamanders, skunks, squirrels and many birds including the local wild turkey flock.